The La Quinta Inn presents a side of Las Vegas with which you may not be familiar with. No flashing neon signs. No ringing slot machines. Just a quiet intimate environment, custom fitted for the discriminating business or leisure traveler. Located just one mile from "The Strip", and adjacent to the Howard Hughes Corporate Park, the La Quinta Inn offers the perfect location. The courtesy 24 hour shuttle will take you to and from "The Strip" and McCarren International Airport. The La Quinta Inns 250 rooms and suites are significantly larger than your average hotel room. Each room offers coffee makers, hair dryers, phones with data ports and voice messaging, free local phone calls, 25" televisions with free HBO and "on demand" pay-per-view movies and Nintendo games. Some rooms offer whirlpool tubs. Also, start your day with a complimentary "First Light" breakfast. This unique non-gaming hotel has a crystal clear heated outdoor pool and relaxing spa. Enjoy the warm Las Vegas weather. The conference facility can accommodate up to 100 people in a business meeting or social function. 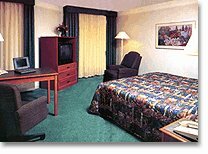 La Quinta Inn also provides full catering services and state-of-the-art audio and video equipment.